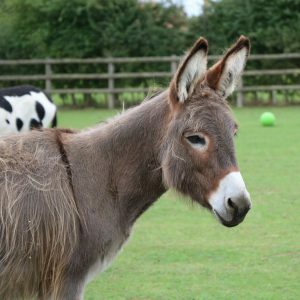 To celebrate our 50th Anniversary year, we would like to introduce you to three new adoption animals: Marlene, Pip and Sammy. 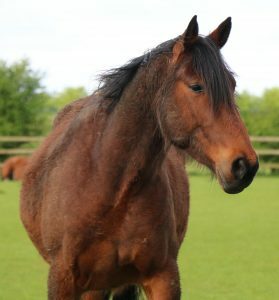 Marlene was abandoned with her foal Janice in 2014. 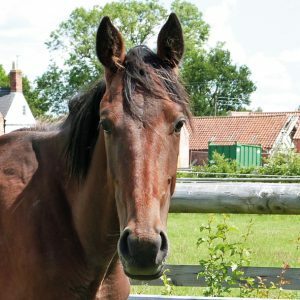 Pip was abandoned in Lincolnshire with his friend in 2012. 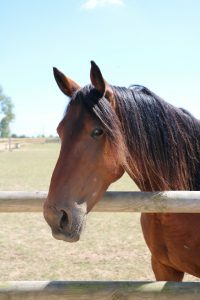 Sammy was rescued from unsuitable conditions in 2011. 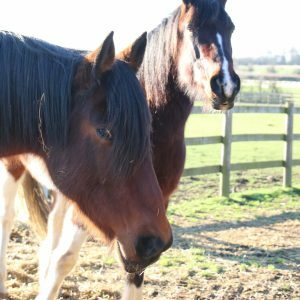 Marlene’s friend Annabelle is recovering well from Laminitis and the pair are now gradually returning to their friends in the field for a couple of hours a day while Annabelle adjusts. 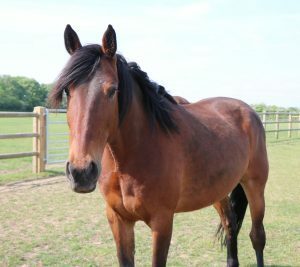 Marlene has enjoyed being on the Visitor Centre Yard and still adores the attention from passing visitors, but she is especially happy to be going back out in the field with everyone else. Pip welcomed back good friend Alex to the field this week and he was over the moon to see him return, even if it meant he had to share his friend with his other field mates. 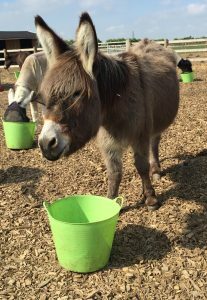 Pip has also made a new friend from the girl herd next door, Maleficent the mule. They both enjoy grooming one another over the fence and are becoming very good friends. Sammy has had a great month and is now medication free. The wound from his eye removal is healing well and the stitches have been removed. 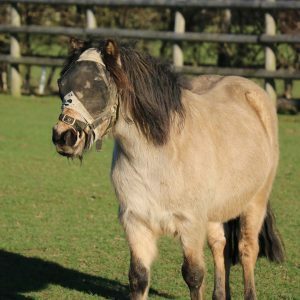 Despite having his eye removed, Sammy’s confidence with human contact is still growing which staff are really pleased to see, as they would expect him to be quite nervous and anxious after his surgery. When the farrier visited Sammy last week, he was very well behaved and it was a noticeable improvement to previous visits. Staff will continue to monitor his eye to ensure he is comfortable and that is heals correctly. Marlene, Gnasher and Annabelle are in the thick of the action at the moment with being in the Visitor Centre courtyard where they seem to have taken on the role of the welcoming committee for visitors arriving. 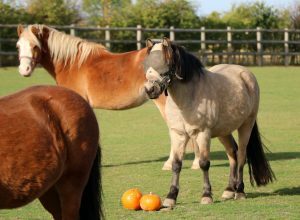 Annabelle has laminitis (inflammation and pain in the feet), so is resting up in the stable but this hasn’t stopped her from making new friends and winning over new visitors on their day out. Marlene has been equally as happy with the attention she is receiving and is often quite vocal when it is getting quieter. 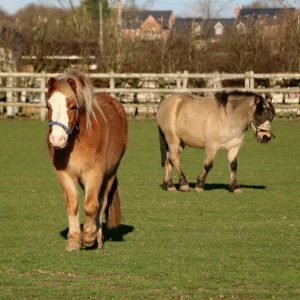 Pip has not had his friend Alex with him while he was keeping another horse company who was being slowly introduced back to grass so Pip has been a little lonely. Although, the half term visitors seemed to help take his mind off his friend not being there, much to Justice’s disgust that visitors may come to see horses other than him! Pip seems to be getting on well with Justice (despite stealing his attention) and Beau while Alex is away but he is looking forward to welcoming him back when he can. Sammy has had quite a month. 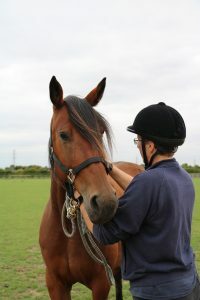 He started to show signs of pain earlier in the month from his eye, the pain then caused him to have a colic episode. The pain didn’t seem to subside so the decision was made to remove his eye completely. He is now recovering on the Visitor Centre Yard where staff will monitor him closely for the next couple of weeks. 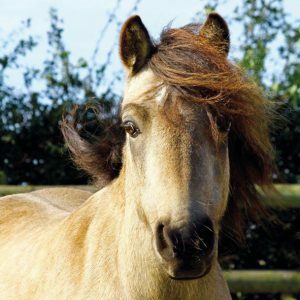 Sammy has been very well behaved throughout the whole procedure and the staff are very proud of his courage as he is not known to be a confident pony. 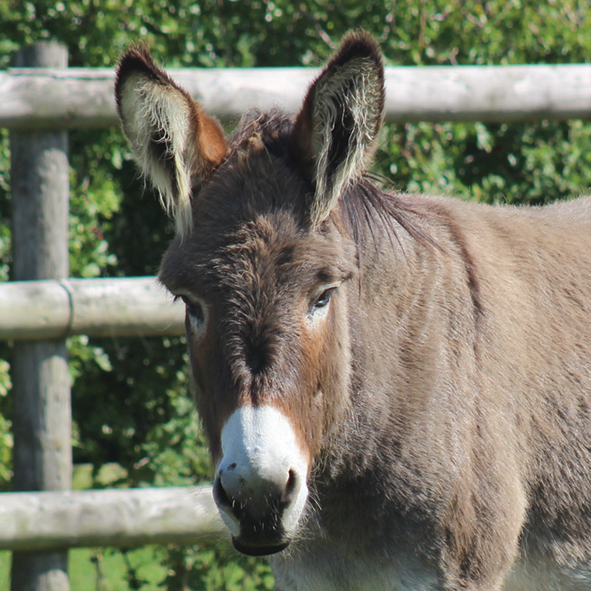 Cheeky Marlene has been enjoying having some logs on the pad to munch on – instead of the fencing! This means she isn’t getting told off anymore and instead she is getting rewarded with her favourite back-scathes from the staff! She and her friends are also enjoying playing a game of tug of war at the moment with the scented jolly balls, she doesn’t like losing so puts everything in to it. Pip loves nothing more than running around the field, so is very glad to be back there again this month now that the weather is a little drier. You can also say that he likes his hay too! Pip is always one of the first ready to greet the staff each morning and evening when they deliver it. 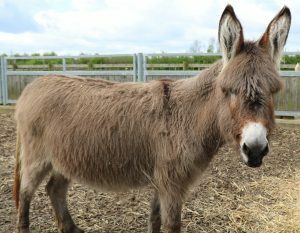 This month the vet came to see Sammy to check on his eye, with the prognosis being that he is now blind in his nearside eye. The good news though is that it isn’t causing him any pain and it doesn’t seem to be making him uncomfortable. Staff are making lots of checks on him though, and if they notice any cause for concern, the vet will come back to have another look at him. Marlene has been very popular over the festive period with lots of dedicated fans coming to visit her and take part in the Christmas activities. She and Gnasha were always willing to please the visitors by walking along the fence for a fuss and cuddle when they were on the way past. Marlene has also decided for the New Year she would like to be fed first in the morning (along with Gnasha). 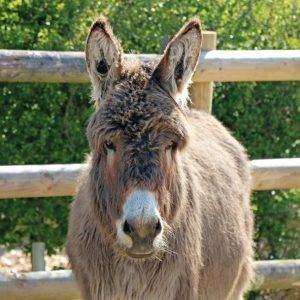 This has meant that staff have been in trouble if they dare go and feed the boy donkey group before her and her friends, but all is forgotten when they come with food and a back scratch! Pip and his friends have moved to a straw pad for a short time whilst their field is rested. 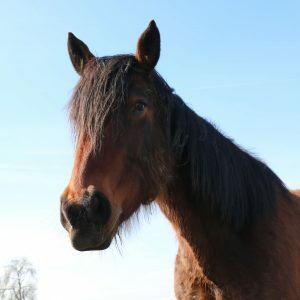 He is very cosy in a big straw bed, however he missed being closer to the Visitor Centre Yard throughout December as he is very partial to meeting visitors and getting lots of attention. Some visitors still made the trip up the walkway to see him and he was very pleased with that! Sammy’s best fiend Bobby is still keeping another horse company as they are not feeling very well, so Sammy is making the most of the peace and quiet. He hasn’t seemed too bothered that his friend isn’t with him at the moment and is very happy to keep himself company and take in everything going on. There has been plenty for Sammy to see throughout December, especially the Christmas Jumper Walk where lots of dogs came along as well! Although, he didn’t come along and meet the dogs, he was very interested in watching what was going on. 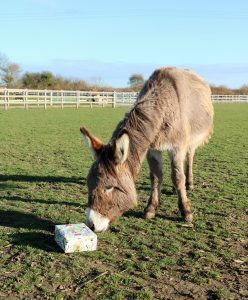 Marlene is no silly donkey when it comes to the cold and wet weather, staff have seen her on many occasions making her way to the shelter just in time for the wet weather which is very clever of her! Although her coat is growing much thicker for the winter, she continues to make full use of her shelter- and rightly so! Her winter management is also well underway in order to prevent her from seedy toe, like last year. She is having iodine applied to her feet daily to ensure no bacteria can get in! 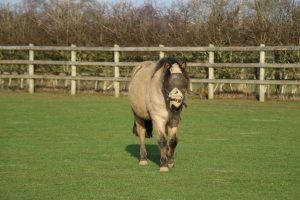 Pip was getting a little frustrated being away from all his friends while he spent some time keeping Dickon company on the Visitor Centre Yard, so he has moved back to the field, to be with them again. 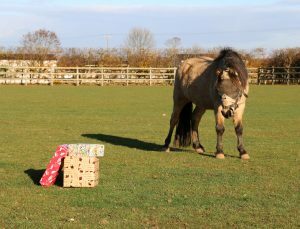 In the last week of November, Pip had a visit from the farrier to trim his feet and make him look smart for his fans visiting him through the festive period, but it wasn’t long until he was giving them a test out having a run around the field when he returned to his friends. If that wasn’t keeping him warm enough, they are all receiving some extra hay to keep them full as well! Sammy allowed his good friend, Bobby, to go and keep another horse (who wasn’t feeling too well) company for a little while. In the meantime, Sammy has been enjoying the peace and quiet on his own and has been having weekly check-ups with his eye. He and his friends have had a new hay feeder topper to make sure they don’t gobble up all their hay at once. It hasn’t stopped them all trying to work out how to remove it though, with some successfully sneaking their head under! Marlene’s recovery from her seedy toe has been a long process but thankfully she has made a good improvement and has now stopped having her bute every day. Staff will be monitoring her closely to make sure she is comfortable and adapt her routine if they need to. Although, Marlene now has a suspected foot abscess so she has a poultice on to try and treat it. 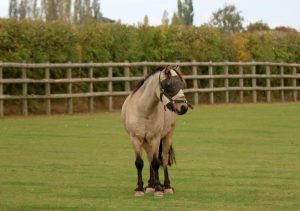 Pip was a little disappointed when Justice arrived back at the field this month as he was enjoying being the boss of the field and getting himself into mischief. However, he soon changed his mind when he noticed he was moving onto the Visitor Centre Yard to keep Dickon company, which meant even more attention from visitors. He was even more thrilled when he realised the move meant that he received his butty with his medication in it even earlier, as he was closer to the feed room! Pip greeted visitors throughout half term and Halloween and loved to see the scary costumes coming through the door! Sammy’s confidence seems to be growing everyday and with it he is being very cheeky indeed! He is feeling extra happy at the minute and his sweet itch rug has now been removed because there are not so many flies around to pester him in the winter. 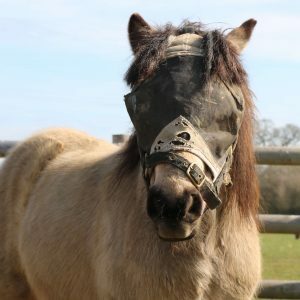 Although that is no excuse for his numerous attempts at removing his face mask when he feels like it, or at least allowing his friends to play with his mask! 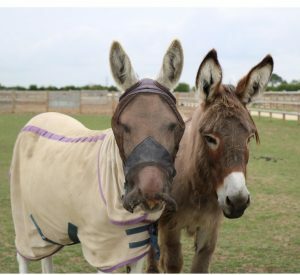 Sammy is spending a lot of time with his new best friend, Bobby, who is also being very cheeky- we wonder where he gets it from?! The pair find it highly entertaining to have a race when it comes to being caught and obviously it is in the opposite direction to where staff are wanting them to be! 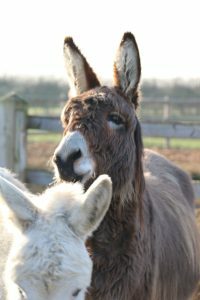 Marlene is enjoying herself being out in the field full time and especially being back with her friends, the donkey girls. 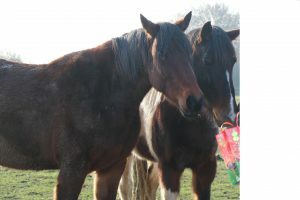 Her friends have missed not having Marlene and Gnasha in the field so are delighted for them to be all back together. Even more good news, Marlene has also had her pain relief reduced as she seems to be more comfortable on her feet, staff are really pleased with her progress and have their fingers crossed that it continues to improve. With his friends: Justice and Dickon still on the yard, Pip is fast-tracking his big boss training to try and keep his top spot in the field. The others don’t seem to be too bothered by this and are happy for him to think he is the big boss, that is until Justice comes back! Pip is very eager for his medication (which comes in the form of a butty), and he runs over to staff for it without fail every morning. 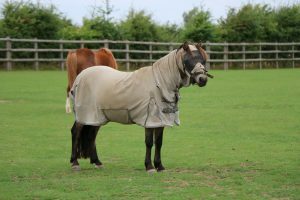 Sammy was very pleased to have his sweet itch rug taken off, so he could enjoy a good roll around in the mud, however he was less than impressed that this meant he had to sacrifice his butty at dinner time (which had his sweet itch medication in). He has been spotted waiting at the gate hopefully in the evenings, only to be disappointed when no treat arrives. This didn’t seem to be a problem at the Autumn Fayre, as he was far too busy being fussed to even think about a missing butty. 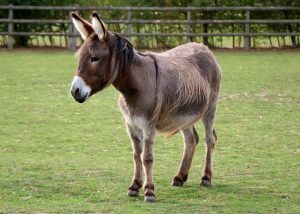 Marlene’s foot condition has improved, and she is now able to go out full time with Gnasha and the rest of the donkeys. The little bit of rain recently has made the ground a touch softer which is good for Marlene, as it is more comfortable for her to walk on. 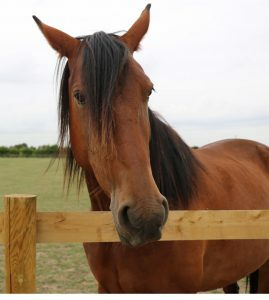 She has also received a lot of attention over the summer holidays and has loved the fuss from visitors. 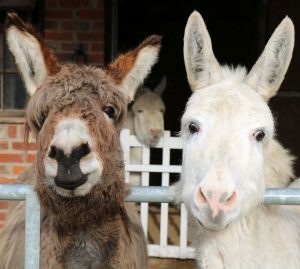 With his best friend, Justice, keeping Dickon company on the yard, Pip has been making the most of having no one steal the attention away from him. However, this has made him a bit of an attention hogger, so he is having a little training to help remind him of his manners. 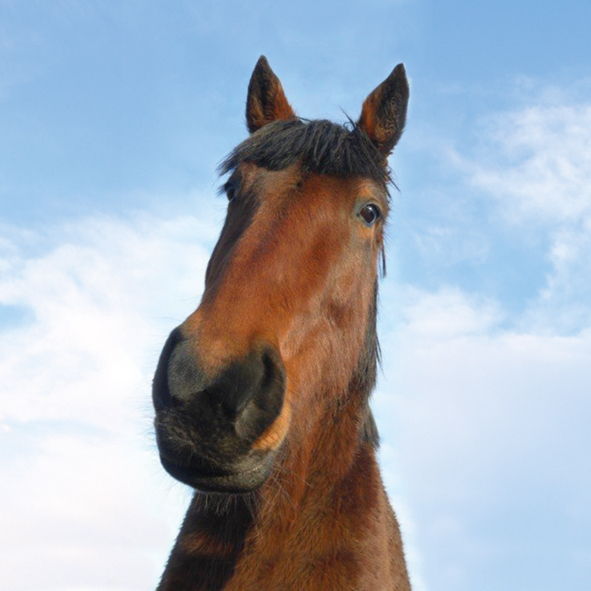 It seems the fame of being an adoption horse has gone to his head! 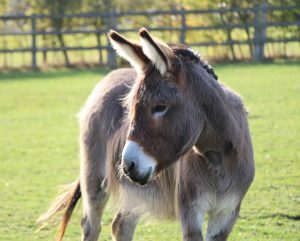 Sammy’s confidence continues to grow and he is now becoming very cheeky with his new sense of confidence! He is always at the gate in the morning for his breakfast and cuddle from staff and is starting to want to interact with the public a little. It will soon be time for his sweet itch rug to be removed for the Autumn which he will be very pleased with, as will staff as it means he will no longer try and pull it off every day. Marlene’s footcare is still being monitored and she continues to receives pain relief for the next coming months to help with her seedy toe, however with her best friend Gnasher by her side there is not a lot that Marlene won’t take on! Her and Gnasher have been spending some time in the Courtyard area where they eagerly await the arrival of visitors throughout the day, especially ones with dogs as they have both taken a keen interest in making friends with them. Pip has now been side lined as Justice’s best friend and he has found a new friendship in Sophie; however, this hasn’t phased Pip as the attention from visitors is far more exciting to him! 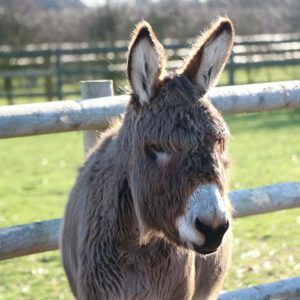 Pip is proving to be a hit with visitors for his willingness and affectionate personality and he is always more than happy to pose for the camera! 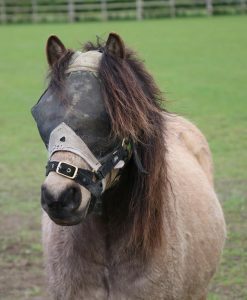 Since the confirmation that Sammy has lost nearly all the sight in his eye, staff are still carefully monitoring for any changes, he is therefore still wearing his fly mask to protect him. Although this hasn’t stopped him enjoying his time with the new visitors and his confidence has grown with human interaction which is great to see. Marlene has had a check up on her feet regarding her seedy toe and because of the hard ground was a little sore. 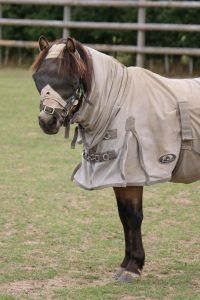 The farrier has been to give her remedial farriery which should help her and she has been given pain relief in the meantime to make sure she is comfortable. Matilda is coming into the barn at night with her good friend Gnasher to keep cool and because of the ground being so hard. She will continue to be on pain relief for the next couple of month and will be continuously checked to make sure she is happy. Pip took part in and enjoyed his first ever adoption day with some of his new adoption friends. He had many fans come and visit him and he loved the extra attention and pamper from staff before the big day to ensure he was looking his best. 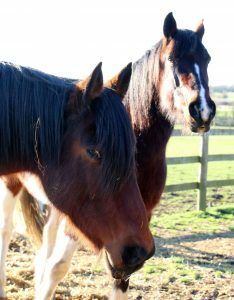 Pip has also taken a liking to adoption star Sophie and her girlfriends who are in the field next door, but he still remains best friends with Justice. Sammy took part in the adoption day and gained a new adoption fan when they fell in love with him at the talk. He has also had a check-up from the vet regarding his eye and it showed he has lost nearly all sight in his left eye, however this isn’t causing him any pain and staff are monitoring if there are any changes in either eye for the future. Sammy doesn’t let his eye effect his fun though and has been happily playing with his new friend, Digit. 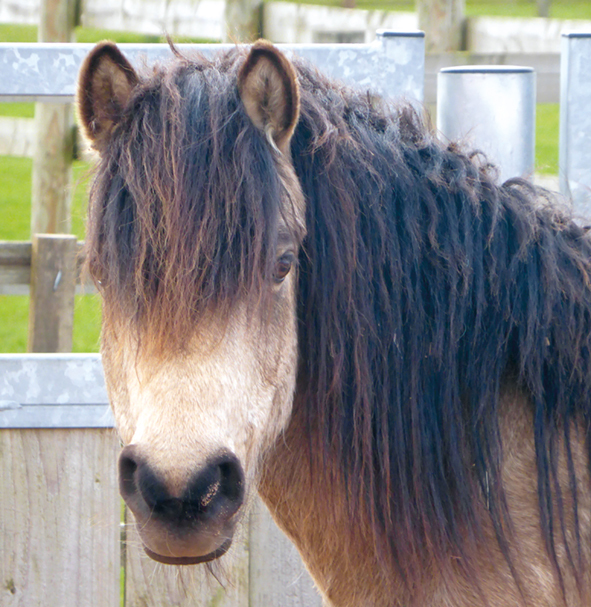 Marlene has been suffering with white line disease which is a condition effecting her hooves. She has now moved back to the Visitor Centre where she is meeting her new adoring fans. She is with her good friend Gnasher and her feet are improving with the new management. Everyone knows when Marlene is ready for tea or bed as she becomes very vocal. 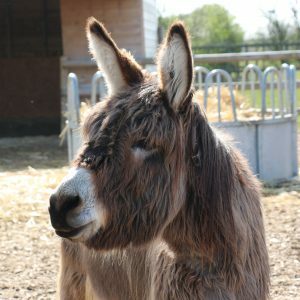 She is looking forward to a good groom to remove her winter coat so she can enjoy the summer weather! 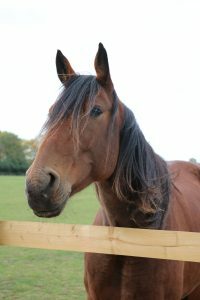 Pip has been missing his visitors as the walkway near his field has been extended and their fields adapted so the walkway has been closed for a while. He is very excited that is it nearly complete and can’t wait for everyone to see what has been done! Pip has quite enjoyed watching the goings on and making friends with the workmen that were onsite. 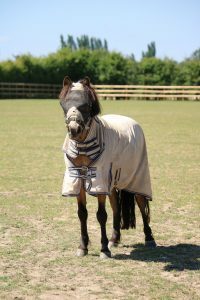 Sammy is prepared for the summer and has begun to wear his special rug to protect him from insects that cause sweet itch. 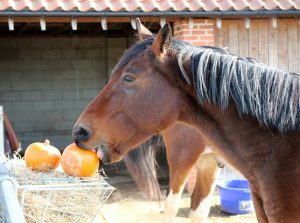 He has also started medical treatment to help with his sweet itch throughout the warmer months. 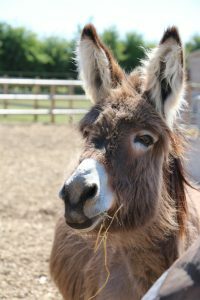 Sammy is always waiting at the gate in the morning ready to meet the staff for a cuddle and has especially enjoyed meeting new visitors over the May half term and at the Summer Fayre in June. 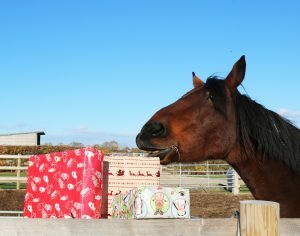 Pip is also adapting well to his new role as an adoption horse. He has teamed up with fellow adoption veteran, Justice. 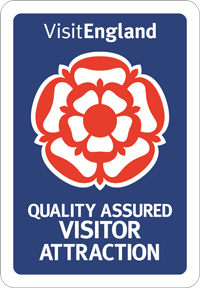 Together they are doing a great job of welcoming visitors and showering them in kisses! Pip didn’t want to miss out on all the fun at the ‘Meet the Police Horses’ Tour and made sure his presence was known along with his field mates Benson, Justice, Saratoga and Gainsborough. 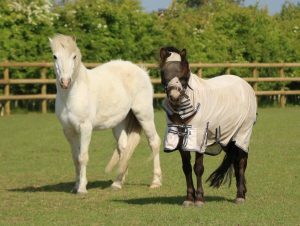 Sammy is enjoying his new-found fame as an adoption pony and is now living with some fellow adoption stars. He is wearing his face mask full time and despite the sunshine is coping well. He is also keeping his mask on much to the welfare staffs’ delight; his eye is being managed but the mask will prevent any further damage. This winter he has enjoyed having extra hay to help maintain his weight, especially when the snow arrived and hid the grass for a while!